Showing results for tags 'seiw'. Hi guys, I’m thinking about getting an Aero screen to swap out on my SEiW for track days and I also want to take the windscreen and uprights off to recondition /repair. I’ve seen a few cars with different types of aero screens on but not sure which is the easiest to fit (flexible to change) or most appropriate for my car. Any guidance or assistance would be much appreciated, thanks! 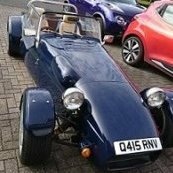 For sale is a Jap style sloping roll bar. Previously fitted to my SEIW, only removed due to cage being installed. Various wear / storage marks but in generaly good condition. Collection from Abingdon or postage at buyers cost. Looking for £55 (offers welcomed) plus postage. I have recently ordered a wide track front suspension kit, and realise that I will need the longer brake hoses which I think can be achieved by using rear hoses. However it appears that Westfield are out of stock and aren't expecting any in for at least 3 weeks. I therefore wondered if anyone can recommend an alternative source, and what end fittings will be required please? Pair RH and LH factory engine mounting brackets to suit silvertop Zetec into SEI Wide chassis. Original condition, powder coated, and never used. Any offers?